Check out this cool video footage from a flyover above Grise Fiord and some spectacular ice formations. Enjoy the weekend! Churchill has polar bear alert to protect residents and tourists from harm. Grise Fiord, Nunavut’s northernmost community with a population of 148, may soon have muskoxen alert for the same reason! Two muskoxen have been seen along the coast and another has been a hindrance near the airport runway. 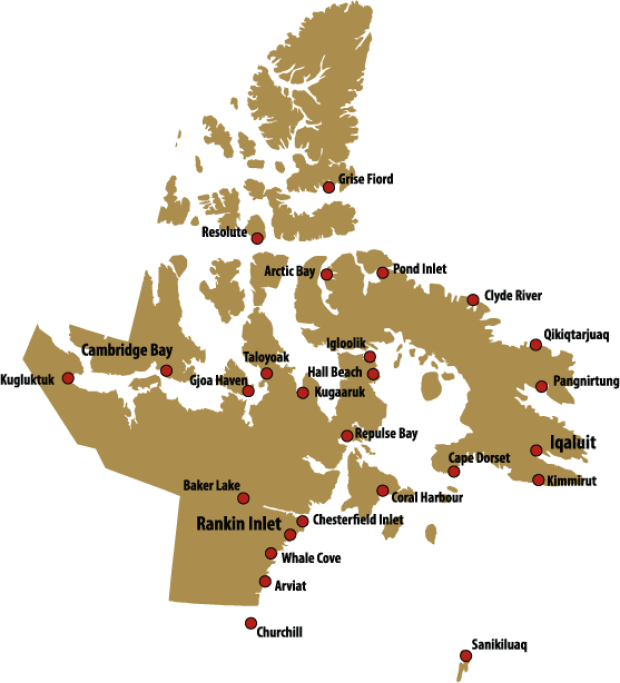 Grise Fiord’s population of 148 is the smallest community in Nunavut. located on the southeast coast of Ellesmere island it is also the most remote. Government of Nunavut image. Grise Fiord mayor Meeka Kigutak says the muskoxen are likely on a natural migration path though are very territorial. There’s a chance they will move away from the town on their own but are fair game for residents if they come closer and linger. “The wildlife office has advised us that anyone in our community can catch the two muskox.”, Kigutak says. Muskoxen on the coast at Grise Fiord. Joanne Dignard photo. Kigutak says the community of Grise Fiord is already a little on edge following the apparent tracking of a local woman by a polar bear last winter. Over a decade ago a child teasing a muskoxen was injured when the animal charged him. Muskoxen have sharp tusks and become aggressive when cornered or threatened. No incidents have been reported since. Muskoxen blending with the rocky coast in Grise Fiord. Joanne Dignard photo.